Albena Sea Resort in northeastern Bulgaria - recently hosted a press conference concerning an important EU-funded project for the restoration and protection of Baltata Nature Reserve, which lies next to the resort. Rondon Ridge Lodge is located at 2,100 meters above sea level in the refreshing Papua New Guinea Highlands. Guide to leading birdwatching lodges, hotels and cottages around the world - homes made for birders. A great Bulgarian ornithologist and conservationist, as well as staunch supporter of Bed & Birding concept, passed away on Christmas Day. Bed & Birding partner hosts a mega rare winter visitor! We wish all our Bed and Birding Partners a very Merry Christmas as well as a Happy and Prosperous New Year! Cooperation Agreement concluded between Bed & Birding and Swarovski Optik. We are very pleased to announce that, once again, Bed & Birding will hold a stand at the British Birdwatching Fair. Swarovski Optik has become a corporate partner of Bed & Birding. We are proud that this year Swarovski Optik have given us their support; such recognition is a real boost for our network and bodes well for our future development. Dear Bed & Birding partner, We wish you a very Happy Christmas and a prosperous New Year - and especially great success for all your birding activities! Once again, our forth year at the British Bird Fair was a great success. A new Presidential Suite has been added to Rondon Ridge, named Villa Wingti after a previous PNG Prime Minister who was born in the Mount Hagen area. Conservation and Birdwatching at Bellavista Lodge and Reserve is our reason for existence. Bed & Birding partner hosts a mega rare bird from Siberia. Siberian Accentor (Prunella montanella) reported from Lithuania. Our third year at the British Bird Fair was the most successful ever. The oldest and largest Bird Fair anywhere (it has over 22,000 visitors) was held from 19 to 21 August 2016. B&B Partner hosts exotic visitor! Pallas’s Leaf Warbler (Phylloscopus proregulus) reported from Bulgaria. We are delighted to announce that Grand Bahama Birders' B&B, located in the western part of the Grand Bahama Island, is the latest partner to join Bed & Birding. Our stand at the British Bird Fair last week was a great success. We were visited by many potential partners from around the world, Norway to New Zealand, Australia to Argentina, Ethiopia to Ecuador, Iceland to Bahamas... We are looking forward to welcoming several new partners in the near future. We are very pleased to welcome Al Natural Resort in Panama as our newest Bed & Birding partner. Come and meet us at our stand 34 in Marquee 1 at the British Bird Fair to learn more. We are delighted to announce that over the last year our partnership has more than doubled from 11 lodges to 24 lodges, and from 8 countries to 13 countries. Bed & Birding shaking hands across the globe! Bed and Birding exhibited successfully at the Bird fair 2014. We are delighted to announce that Bed & Birding has recently welcomed five new partners from Greece, Bulgaria, Finland, UK and Peru. Bed & Birding will hold a stand at the Birdfair 2014. We wish you all a Merry Christmas and a happy, healthy and prosperous New Year 2014! We are delighted to announce that Complex Cormoran, an outstanding location in the Romanian Danube Delta on the left bank of the Sfintu Gheorghe branch is the latest partner to join Bed & Birding. Dear Fellow Birders, Dear Accommodation Providers! We are delighted to bring to your attention the creation of our blog, in which we would like to share information related to the Bed & Birding network. 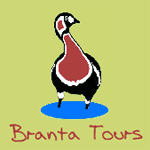 The following is a brief outline statement concerning this new concept in bird-tour management, accommodation and promotion.